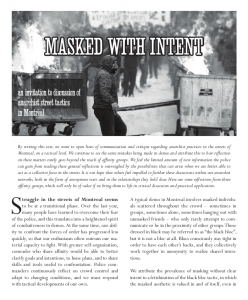 By writing this text, we want to open lines of communication and critique regarding anarchist practices in the streets of Montreal, on a tactical level. We continue to see the same mistakes being made in demos and attribute this to how reflection on these matters rarely goes beyond the reach of affinity groups. We feel the limited amount of new information the police can gain from reading these general reflections is outweighed by the possibilities that can arise when we are better able to act as a collective force in the streets. It is our hope that others feel impelled to further these discussions within our anarchist networks, both in the form of anonymous texts and in the relationships they hold dear. Here are some reflections from three affinity groups, which will only be of value if we bring them to life in critical discussion and practical application. Struggle in the streets of Montreal seems to be at a transitional phase. Over the last year, many people have learned to overcome their fear of the police, and this translates into a heightened spirit of combativeness in demos. At the same time, our ability to confront the forces of order has progressed less quickly, so that our enthusiasm often outruns our material capacity to fight. With greater self-organization, comrades who share affinity would be able to better clarify goals and intentions, to hone plans, and to share skills and tools useful to confrontation. Police commanders continuously reflect on crowd control and adapt to changing conditions, and we must respond with tactical developments of our own. A typical demo in Montreal involves masked individuals scattered throughout the crowd – sometimes in groups, sometimes alone, sometimes hanging out with unmasked friends – who only rarely attempt to communicate or be in the proximity of other groups. Those dressed in black may be referred to as “the black bloc”, but it is not a bloc at all. Blocs consciously stay tight in order to have each other’s backs, and they collectively work together in anonymity to realize shared intentions. We attribute the prevalence of masking without clear intent to a fetishization of the black bloc tactic, in which the masked aesthetic is valued in and of itself, even in the absence of the revolt that masking up is supposed to facilitate. Or, perhaps paranoia and social awkwardness are barriers to communicating with unknown comrades, and hence people remain isolated. We all have to break through these communication barriers in order to sharpen our struggle together, to respond quickly to opportunities with force. All too often, a few stones are thrown in isolation as a symbolic gesture before a dispersal that the crowd is unprepared to repel. The goal of engaging in confrontation has to be clarified and discussed; for us, it is to free space from police control, which we see as a prerequisite for anything interesting to follow. Ritualistically smashing a bank window without the capacity to push back the police will often, predictably, cause the demo to be attacked and dispersed. Such one-off attacks do little to build our rapport de force in the street and our capacity to sustain struggle, to take and defend space. Our attacks should be practiced in a way that collaborates with the larger demo instead of using them as cover without regard – or an ability to respond – to the consequences. Instead, we can concentrate forces on targeting the police, seeking to make them retreat and break their control over the crowd. Having done this, we can destroy all the capitalist property we want, without leaving the rest of the demo to bear the brunt of the police crackdown brought about by our all-too-brief actions. Reflections on informal communication in demos. Lines of communication should be opened in the section of the demo that is willing to be confrontational. One form this could take is an anonymous impromptu ‘spokes council’. One person from each group could huddle to discuss general strategies and plans that make sense to be shared. This spokes council could re-form at any crucial point during the demo to make more collective decisions impacting all those who want to fight. An example of this occurring very successfully was during the G20 in Toronto. The black bloc – which actually functioned as a well-organized bloc – had a spokes council during a crucial moment after trying to head south to the guarded G20 perimeter and being pushed back with batons. The spokes council contributed to the bloc sprinting east away from the perimeter and through the downtown core, confounding police expectations, and leading to over an hour of heavy rioting and two torched cop cars. This is but one example of how we could improve our communication in a well-organized bloc. It’s not a panacea, spokes councils can be difficult to put into play. Often, shouting slogans (“to downtown”, “stay grouped”, etc.) will work just fine. But if we want to better coordinate ourselves, we must reflect on more effective means of communication. One of the SPVM’s most notable crowd-control adaptations has been to flank the left and right sides of the section of the demo they deem most likely to cause trouble. At least sixteen unshielded police walk on each sidewalk, with at least one rubber-bullet gun, usually in the middle of the line. During May Day 2012, when they flanked only on one side, we saw how the bloc did not have the confidence or organization to offensively attack them. As a result, they were able, at the moment of their choice, to cut through the demo when we were vulnerable and make arrests before retreating on Ste-Catherine. The Urban Brigade will always act at an intersection so that they can retreat on a street that demonstrators aren’t occupying. They will then keep the crowd at bay with rubber bullets while they complete their arrests. A new addition to this tactic has been to position horses at the rear of both brigades, generally three on each sidewalk. They play a double role: intimidation and being above the crowd to identify targets for eventual arrest. Interestingly, on February 25, 2013, during the first demo against the Summit on Higher Education, after months of these flanks successfully controlling demos, the crowd had the collective intelligence to fill the sidewalk behind the left flank, trying to force them out of the demo. If we refuse to yield the sidewalk to the Urban Brigade, this new tactic which has so far been very successful at policing us will be largely compromised. Those who took the sidewalk were not materially prepared for the close-quarters confrontation that must follow from this assertion of space (apart from several paintbombs), so the police were able to hold their ground. They nonetheless needed the brigade that was on the other sidewalk to break the encirclement. One intersection further down, the Groupe d’intervention unit (GI, riot police with full armour and shields) was waiting to charge the demo, throwing at least two flashbombs. If there had been a tight bloc with different groups in communication with each other, and with reinforced banners to the front and sides of the bloc backed up by long flag poles, this confrontation could have gone further. Of course, once we rid ourselves of the Urban Brigade, the actual riot police will be put into action, but we will have at least made ourselves less vulnerable and increased our chances of successfully confronting the other police forces (including the undercovers). That said, once rioting has kicked off and police begin dispersing, it can make a lot of sense for groups of 10-20 within larger splinters of the demo to keep doing their own thing, making the situation that much more uncontrollable. This brings us to the question of material brought to be used during demos. Lately, we’ve seen people self-organizing to bring side banners that have greatly impaired the capacity of the Urban Brigade to act. This practice should become systematic. The cops responded by placing horses on the sidewalks; we must think of ways to get rid of them. The better we are prepared to face the Urban Brigade, the less danger it will be to us. A group of 10 people with flagpoles backed up by rocks would be sufficient to push back the Brigade, but not the GI with shields. The construction of barricades and defence of occupied spaces such as squares, parks or large intersections have barely been attempted during the past year, despite all the opportunities we have had. We should experiment with holding space in ways other than the long procession of the traditional demo, which is relatively easily for the police to cut into pieces (cutting the demo in two is even the first step in the dispersal process used by the SPVM). For instance, if a square is filled with demonstrators who are unwilling to abandon their comrades, and the main entrances are all barricaded, police could be fought back for hours. Behind the barricades, we find the possibility of transforming the often fleeting and fragile nature of our attacks, opening up time and space for rebellion without an endpoint, to be elaborated with joy. We can see that this lesson has been learned during rioting in Athens, Barcelona, etc. By barricades, we mean objects that can substantially impede police movements, like flipped dumpsters or cars that are bumped into both sides of the street by lifting and rotating the back (lighter than the front). The street signs and pylons that are used so frequently do more to impede our movements than police movements. They can even be dangerous for inattentive comrades. If barricades can be made quickly when moments arise where we find ourselves in a fitting location (for instance, without too many entry points, with a significant amount of rocks that can be plied up from the street, construction sites nearby to be raided, parking lots offering ample cover as seen on April 20, 2012, around the Salon Plan Nord), we can hold our ground and fight from behind the barricades, obstructing the charges that have ultimately dispersed us successfully at every demo to date. Returning to the example of last May Day, at the corner of University and Sainte-Catherine after the Urban Brigade was fought back with projectiles, we all knew that the GI would arrive any minute in lines too heavy to fight back with only rocks. Many people busied themselves collecting rocks during these precious minutes, but no barricades were built, so when the GI unit came charging from the south, the demo was chased into undesirable territory north of Sherbrooke and forced to disperse. We know that it is not easy to overcome the fear of repression, that some of us still hesitate to throw the first stone, and that is why we must be explicit within our affinity groups as to what each individual is ready to do. Some will prefer to gather rocks and distribute them to comrades who are willing to attack the cops. Some will be ready to hold the side banners, knowing that they might receive the first blows when the Urban Brigade decides to charge. And some will want to observe and analyze police actions to prevent the demo from being kettled. In thinking critically about our street tactics and forms of self-organization, these are only a few ideas from some of us who by no means consider ourselves experts. We await other contributions toward this end, by those who prefer communicating through texts as well as those who will share their reflections through their actions in the streets.